By sending food, beverages and other supplies up the mountain via these gondola work cars instead of snowcats, Vail Resorts saves vast amounts of fuel, says Luke Cartin, senior mountain environmental affairs manager. 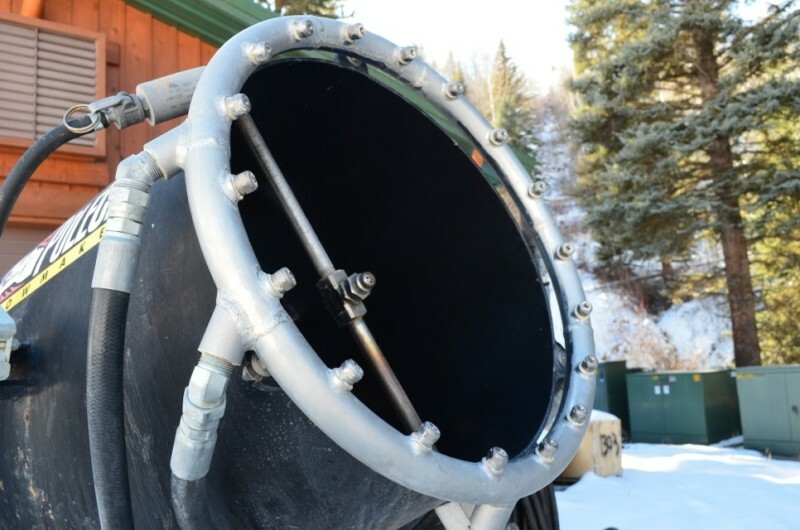 The nozzles on this super-efficient fan gun at Vail Mountain spray water into the path of a high-powered fan. Vail and Aspen are both iconic Colorado ski resorts that have maintained their positions at the forefront of the industry over several decades, but their approaches to perhaps the defining challenge of our time — climate change — have differed. Aspen, seeking to reduce its own environmental impact and to influence the public-policy debate, has positioned itself as a vocal advocate for both practical, on-the-ground tools to reduce its own resource consumption and for policy solutions with a broader, societal impact. Skico executives can often be seen and heard lobbying for climate-oriented policies at the state and federal level and milking all the media exposure they can from the company’s environmentally friendly efforts. Vail Resorts — a geographic neighbor and longtime industry rival — has chosen to assume a much quieter role. Vail is doing aggressive work on the ground to reduce its energy consumption but is generally soft-spoken about global warming and the company’s role, if any, in fighting it. “The impacts of climate change are a serious matter and rightly deserve our attention,” wrote Vail CEO Rob Katz in an oft-cited 2012 opinion piece in The Denver Post. However, Katz added, the potential impacts to recreational skiing are the least of society’s climate-related worries, and the cries to “Save Our Snow” are misplaced. So, for whatever reasons of strategy or philosophy, Vail’s public approach to climate change is completely different than that of Aspen. The companies are much more closely aligned, however, when it comes to their internal attitudes toward sustainability and energy efficiency. Aspenites are well-acquainted with Skico’s multi-pronged approach to energy and the environment, and they might like to think of Vail as a sprawling, corporate energy hog. The truth is far more complex. First, as ski-industry competitors, Aspen and Vail aren’t even in the same weight class. As a family-owned company with four mountains in the upper Roaring Fork Valley, Aspen could be seen as a middleweight, while Vail is undoubtedly a heavyweight. After years of aggressive expansion, Vail Resorts now includes 10 ski areas, including four heavy hitters in Colorado — Vail, Beaver Creek, Keystone and Breckenridge — and three in the Lake Tahoe region (Heavenly, NorthStar and Kirkwood). In the last year, Vail has acquired The Canyons in Utah, a 4,000-acre ski area with associated base-area hotels, restaurants and retail, as well as Afton Alps and Mount Brighton, two smaller resorts strategically located near the urban centers of Detroit and Minnesota’s Twin Cities. Nowadays, when you say the word “Vail,” you’re talking about a publicly owned corporation with 22,000 employees, 10 mountains, 7 million skier visits, 18 hotels, 106 restaurants, 180 retail stores and eight golf courses. Skico is essentially the same company it was back in the 1990s, when it first made the environment a core part of its mission. Vail began offsetting its energy consumption in 2006 by purchasing renewable energy credits, but its ongoing energy-efficiency push began in 2008. The company has since abandoned the credit-purchasing program and has significantly expanded its internal sustainability efforts from 2008-13 while adding multiple mountains to its empire. Vail’s sustainability programs must be understood in the context of a large, vertically integrated organization that operates in six states. The company’s approach to energy consumption is strategic, analytical and systematic. So it’s revealing that, during the darkest years of the Great Recession, Vail Resorts actually expanded its environmental department. 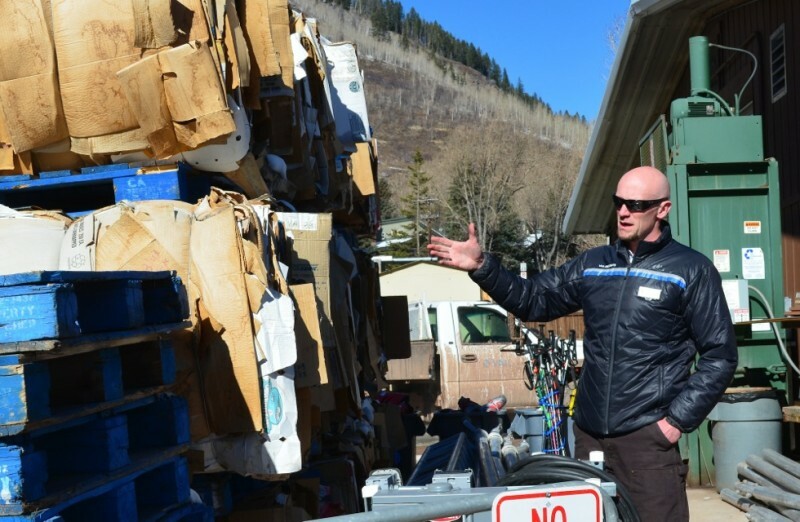 At the shop yard in Vail, the majority of the company's used materials — cardboard, steel, oil, plastic, rubber, wood, ski equipment and much more — is stored for eventual recycling or reuse. Senior Mountain Environmental Affairs Manager Luke Cartin says the yard is the all-important underbelly of sustainability at Vail Mountain. According to Senior Mountain Environmental Affairs Manager Luke Cartin, Vail Resorts had four management-level environmental employees in 2008 but now has 10 such managers. Today, there are roughly 20 people in the company with the words “environment” or “conservation” in their title, and they’re scattered across all the firm’s properties. In recent years, as Vail has added new properties, environmental managers have been hired at individual locations to ensure an operational focus on everything from waste management to water conservation to energy efficiency. Spend a few hours with these individuals, and you’ll see spreadsheets, PowerPoint slides, global-positioning software and other tools that indicate a thoughtful, cost-conscious approach to sustainability. It also becomes clear that they’re passionate about the environment. But the sustainability projects that Vail Resorts chooses for implementation aren’t just good for the planet; they must also be a plus for guests, employees and the bottom line. In other words, the environment is a cornerstone of the Vail customer experience. It also happens that energy conservation, which is universally acknowledged as an environmental benefit, often makes financial sense. Recently, the company replaced 15 air compressors at Vail and Beaver Creek mountains with two high-powered compressors, one at each ski area. The new compressors, which power the snowmaking systems, will use half the power of the old machines they’re replacing and deliver 30 percent more compressed air. At any given time, Vail Resorts has a long menu of possible energy-saving projects to pursue. This particular $1 million investment was chosen because of the bang for the buck — and because it’s seen as a plus for several stakeholders: the environment, guests, employees and shareholders. It’s also a win for the local electric utility, which will see a significant load reduction from one of its biggest customers. Holy Cross Energy provides rebates and incentives to commercial and residential customers who purchase energy-saving equipment and thus reduce the pressure on its grid — especially during the winter peak. “To the extent there’s less stress on our system in winter, we won’t have to build new infrastructure,” Holy Cross CEO Del Worley said. For that reason, Holy Cross supported Vail’s project with attractive custom rebates of two cents per saved kilowatt-hour. Beneath Vail's Lionshead base area is a sprawling underground complex of tunnels and storage rooms. 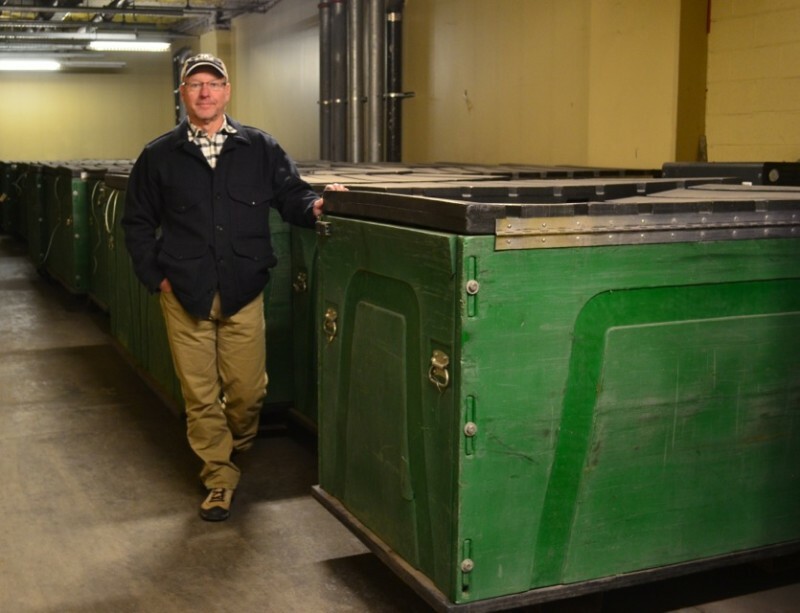 Rick Cables, vice president of natural resources, says these giant plastic bins are loaded with food, drinks and other freight and rolled directly onto work cars at the Eagle Bahn Gondola for swift delivery to on-mountain restaurants. The Vail environmental staff is quick to point out that sustainability is important to the company’s 22,000 employees. That may sound like lip service, at least until Conboy, who oversees energy-related projects at all the resorts, explains from a strategic standpoint. Annual surveys of Vail employees across all resorts and departments ask two important questions: First, do you believe Vail Resorts is a sustainable company, and second, do you understand your role in supporting the company’s sustainability efforts? Eighty-five percent of Vail employees answer both of these questions positively, Conboy said, and that drives employee engagement and productivity. These five areas — facilities, snowmaking, grooming, lifts and food/beverage — are where the company tries hardest to reduce consumption. Two company-wide campaigns have focused on the energy strategy: Target 10 and The Next 10. The now-complete “Target 10” was launched in 2008 and aimed to reduce the company’s overall energy consumption by 10 percent. By the end of 2011, the company had achieved a 10.75 percent reduction that resulted in $2.75 million in savings over three years. Interestingly, most of those savings were attributable to simple data-sharing and behavioral changes; in other words, department heads were made aware of their energy consumption and found ways to reduce it by turning off lights, changing default settings on computers, not idling vehicles and the like. The company is now well into its “The Next 10” program, which was launched in 2012 and aims to reduce energy use by an additional 10 percent. Roughly 4.7 percent in savings already has been achieved, but the reductions tend to get harder and more expensive with each additional step. In other words, the low-hanging fruit has been harvested, and additional savings require capital investment. The air compressors are one example; so is an ongoing $400,000 lighting retrofit involving 19 company-owned sites, in which LED lights are replacing old incandescent bulbs. “This has a two- or three-year payback,” Conboy said, meaning that the electricity savings will equal the cost of the bulbs in two to three years. The behavioral programs and quick-payback projects come first by design in the overall Vail energy strategy because they’re cheaper than, for example, building a hydropower plant on Vail Mountain to generate clean energy. “We get five times more bang for the buck with conservation,” Conboy said. Furthermore, if the company can shrink its overall consumption, then it takes less money and effort to offset that consumption by purchasing solar panels or renewable energy credits. On-site renewable energy projects are expected down the road, but efficiency is the current focus at Vail Resorts. Still, there is an ongoing effort to recycle and re-use materials wherever possible. For example, non-marketable timber from summer forest management projects at Vail and Beaver Creek will go to a new biomass plant in Gypsum, where it will be incinerated for electricity. Luke Cartin (left) and Sean Conboy discuss the benefits of a new air compressor for the snowmaking system at Vail Mountain. The device uses half the electricity of eight old compressors it replaced, while producing 30 percent more compressed air. 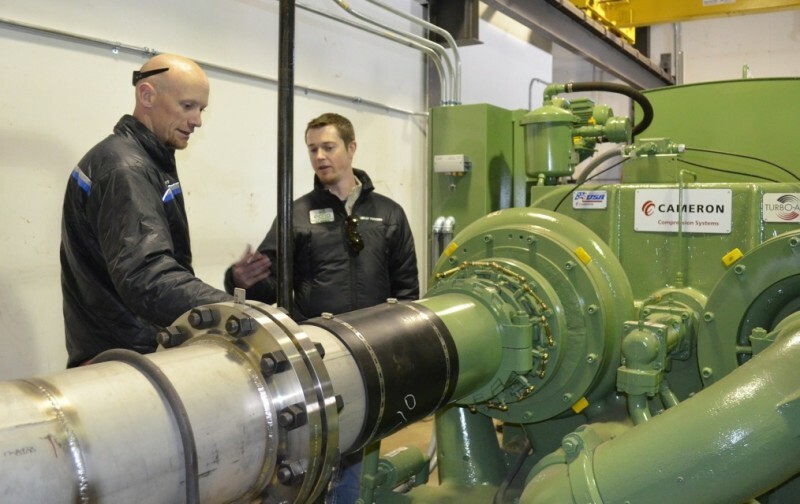 Just as Vail partnered with Holy Cross Energy on the air compressor retrofit at Vail and Beaver Creek, it joined hands in 2010 with Xcel Energy to make energy-related upgrades at Keystone and Breckenridge in Summit County. Working together, the company and the utility identified a series of improvements to snowmaking, lifts, snowmelt and on-mountain buildings. Though only partway through the process, the company has saved some 5.2 million kilowatt-hours, or enough electricity to supply 520 homes for a year, by replacing outdated snow guns, automating electric snowmelt systems and reducing the run-time on heaters that warm the motors and drives in lift-terminal buildings. Xcel and Vail simply installed timers on the lift-terminal heaters to run them less often. Looking down the road, however, Vail is working with lift manufacturers Doppelmayr and Leitner-Poma to create insulated lift-terminal buildings that will retain heat and save even more energy. Three years remain before Vail and Xcel reach the end of the so-called Process Efficiency project, and they predict that energy consumption at those mountains will drop by a total of 10 to 15 percent. The company is currently testing another tool that uses geographic positioning telemetry to track Vail Mountain’s 30 grooming snowcats. The software enables a person to trace the movements of an individual vehicle or all of them at once, and the snowcat routes resemble a Pac-Man game as they unfold on the computer screen. This makes for entertaining visuals, but the real value of the software is the ability to see the snowcat routes visually and look for efficiencies — or other potential environmental benefits. Watching the snowcats inch across the computer screen, Rick Cables, Vail’s recently hired vice president of natural resources and conservation, imagines an overlay map showing the movements of radio-collared wildlife. “If we could correlate the way critters move in relation to the way our groomers move at night, we would learn so much about the way our activities affect those species,” he said. Cables was the longtime regional forester with the U.S. Forest Service in Lakewood and later the director of Colorado Parks and Wildlife. Now he’s in charge of land-use, forest management and wildlife issues at all of Vail’s properties. 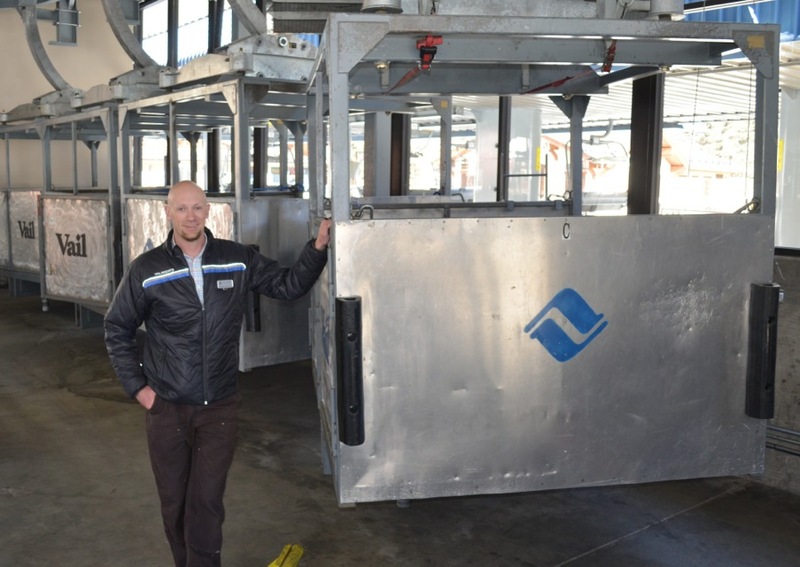 And he sees vast opportunities for the company to proactively conserve and manage land and wildlife, as he knows that wild animals resonate deeply with the public. “One of the things I’ve thought about is how do we play a proactive role in species conservation,” Cables said. Some may scoff at that, given that Vail has been criticized in the past for its positions on ski-area development. Back in the late 1990s, eco-terrorists lit several Vail Mountain buildings on fire to protest a ski-area expansion into what is now called Blue Sky Basin. But Vail Resorts has vastly improved its community standing since then, and Katz, hired in 2006, has made the environment a key part of the company mission. Susie Kincade, a longtime Eagle County conservationist, gives Vail Resorts credit for making the environment a priority both on the mountain and in the community, though she feels the company could do more. Editor’s note: This is the second article in a series of stories produced by Aspen Journalism in collaboration with The Aspen Times about the energy efficiency and sustainability efforts of various ski areas. The first article looked at a unique clean-energy project involving coal-mine methane and the Aspen Skiing Co.
A sense of green urgency at Park City's Powdr Corp.